I keep on doubling back to this insanely beautiful glass wall at the Miami Airport. It’s called Harmonic Convergence by Christopher Janney. It was quite literally, a sanity check-point while navigating a long pilgrimage from The Florida Keys to Chicago with my 86 year old grandmother, Joan. After having to psychically body check a woman who almost knocked my grandmother over, we took a moment to gather our bearings and reposition our luggage. With our luck, it happened in front of Janney’s windows. Meanwhile in Chicago, we had a nice time riding through O’hare Airport. This is Sky’s The Limit, a 1987 permanent installation by Michael Hayden. 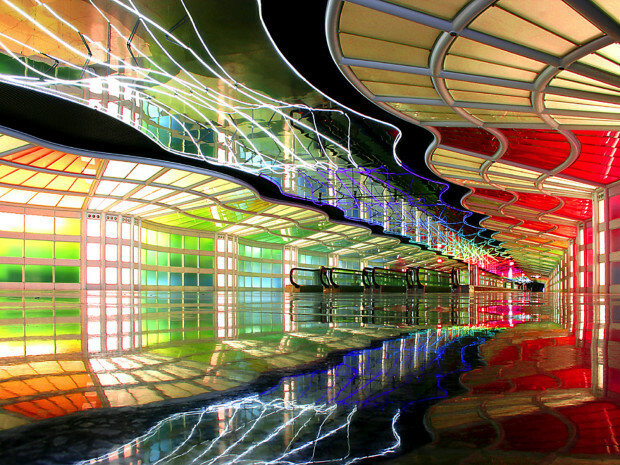 Having grown up in Chicago, I’ve spent hours of my life walking through this installation. It is still one of my favorite experiential pieces. It also started my life long romance with airport art.